The popularity of the Downhills course near Corbridge as a point-to-point venue is shown by a bumper entry of 164 for Saturday's rearranged Tynedale fixture, where an eight race card starts at 12.30pm. The main action is preceded at 11.45am by the first pony racing contests in the Northern Area this season. Both pony races are kindly sponsored by PR Racing of Capheaton and Robson and Cowan. Ringa Bee, Edkay and Astyanax filled the first three places in last year's Members Race and are set to meet again in Sunday's renewal. Edkay (right) was only beaten a length by Ringa Bee in that 2010 race and, with the benefit of a recent outing at Crossford in her favour, will struggle to find a better opportunity to get off the mark. Valgray (left) ran a blinder on his first start for 26 months when three lengths 3rd to Marksmore at Friars Haugh four weeks ago, and a repeat of that effort should be enough to land the first division of the Open Maiden Race for 4, 5, 6 and 7 year olds, in which the main threat may come from Salmon Rising. The second division of the younger horses Open Maiden Race appears to be at the mercy of Mister Splodge (right, pink colours). He fell at the last when still holding every chance on his reappearance at Alnwick last month and a clear round here can see him account for Sierra Peak and Its Bobkat. Anotherbuck (left) had plenty in hand when scoring impressively at Crossford a fortnight ago and a 3lb penalty is unlikely to prevent Ed Wrigley's mount from following up in the NPPA Club Members Race. The other 25 entries are headed by Aggies Lad but his recent form under Rules suggests that he is not as effective on soft/heavy ground. Last Sunday's Alnwick winner, Hold On Julio also merits respect if turned out quickly without a penalty. The 3mile 5furlong Ladies Open Race is the North's major stamina test of the season in this grade and has attracted a quality entry of 19. Prolific winning pointer, Narciso is a thorough stayer and ideally suited by some cut, while recent Market Rasen Hunters' Chase scorer, Keeverfield (left) represents Sam Drake's in-form Guiseley yard. Proven stayers, Tynedale, On Y Va and Minouchka add further spice to the contest. The 3mile 5furlong Men's Open Race also promises to be contested by a quality field. Opio (right) is a class act on his day and his victory in the 2009 equivalent formed the middle leg of an unbeaten three race campaign that year. Punters should not be put off by the fact that he missed last term as he usually goes well fresh. Areyacoddinmee is at his best when stamina is at a premium, the former Henry Daly-trained chaser, Sherwoods Folly is an out and out stayer, while 2010 winner, Lord Who loves testing ground. Another for the short list is last month's impressive Jedforest Open scorer, Gunner Jack who seems to act on any going. The 26 entries for the Restricted Race include recent Maiden winners, Chip N Pin, Lewesdon Tom and Skipping Chapel (right). The former Tim Easterby-trained novice hurdler, Chip N Pin beat Cricket Bat in testing ground at Duncombe Park but may have to play second fiddle here to the progressive Lewesdon Tom, who made every yard of the running on his reappearance at Sheriff Hutton. The concluding Open Maiden Race for older horses has 25 entries and may chiefly concern One Black Cat (left) and Arch. The former shaped well when only beaten a couple of lengths by Rowan Road at Kelso last month, and her time was considerably better than that recorded by Arch when finishing one length 2nd to Marksmore on the same card. The consistent trio, Buckshaw, Hawthorne Bay and Paint Me Silver should also be on the premises. Admission is £8.00 per person. 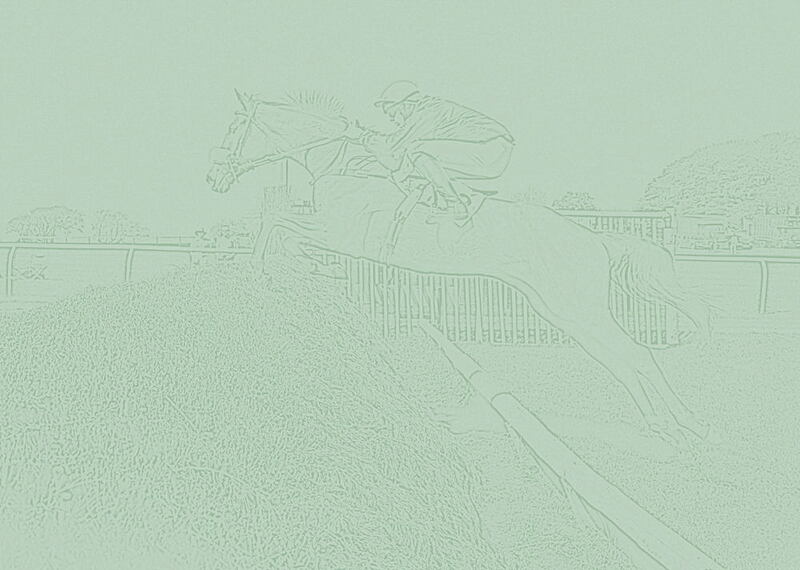 A racecard with runners, riders and race details included can be purchased for £2.00. Children under sixteen are admitted free of charge and students with a valid students union card will be charged £5.00.